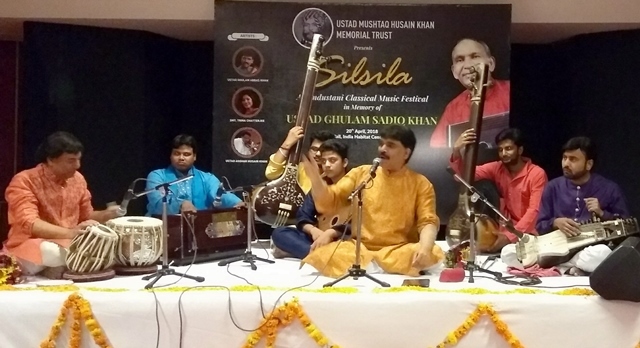 Ustad Mushtaq Husain Khan Memorial Trust organised a Hindustani Classical Music Festival ‘SILSILA’ in memory of Padmashri USTAD GHULAM SADIQ KHAN , who was a great Hindustani Classical Vocalist of famous RAMPUR -SAHASWAN GHARANA. EMINENT EDUCATIONIST and Sr Journalist of India Daya Nand Vats was the Chief Guest on this Auspicious occasion. Maj General Sh Ananta Bhuyan, Aditional D.G Rashtriya Raifles Honoured Mr Daya Nand Vats with Shawl and flowers. 1. TRINA CHATTERJEE who performed Thumri & Dadra . She opened concert with a beautiful Dadra ‘ Ye main Janu ya jaane’ which is very popular composition of USTAD GHULAM ABBAS KHAN of RAMPUR SAHASWAN GHARANA. Trina has a soft , husky and melodius voice. She presented 3 pieces of Thumri Dadra with great control and melody. 2. USTAD ASGHAR HUSAIN from Delhi Gharana presrnted Solo Viloin with lots of tayyari and Raagdari. He was accompanied by USTAD AKHTAR HASAN of FARRUKHABAD GHARANA. Both the artists were great on stage. 3. The star of the evening was USTAD GHULAM ABBAS KHAN who is son and disciple of LATE PADMASHRI USTAD GHULAM SADIQ KHAN of RAMPUR SAHASWAN GHARANA. Ustad Ghulam Abbas Khan presented Khayal in Raag Maru Bihag and Basant. His aakar taans were so powerful. He is probably the only Khayal vocalist of present times who could hit 3 and half octave aakar taans in Khayal. He also presented Tarana in Raag Basant where he used SHUDH MADHAM which is the unique research of RAMPUR SAHASWAN GHARANA. TARANA GAAYEKI is speciality of RAMPUR SAHASWAN GHARANA.